Journaling can help your organization respond to legal, regulatory, and organizational compliance requirements by recording inbound and outbound email communications. 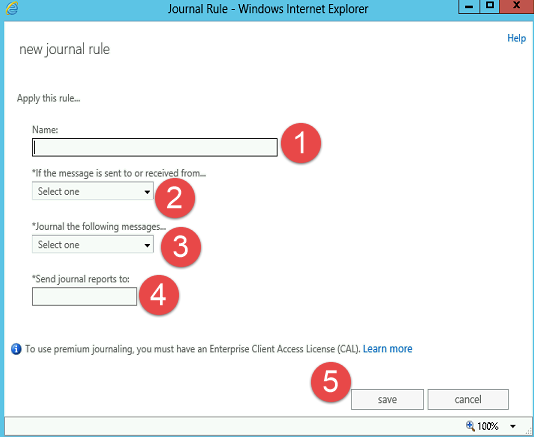 When planning for messaging retention and compliance, it’s important to understand journaling, how it fits in your organization’s compliance policies, and how Microsoft Exchange Server 2013 helps you secure journaled messages. Exchange Administrator with full access. To enable journal rules, an Enterprise CAL must be purchased. Port 25 needs to be open. Type in the user that will be configuring jounaling. Step 1 -> Click Recipients. 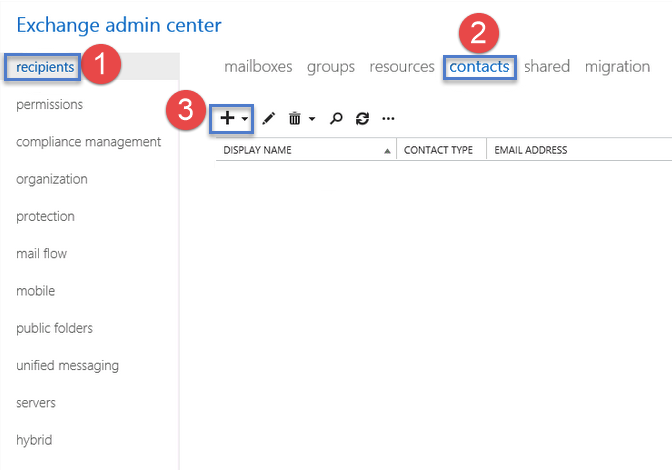 Step 2 -> Click Contacts. Step 3 -> Click the + button. After that click “Mail Contact”. Step 1 -> Enter a First Name for the Journaling contact. Step 2 -> Enter a Last Name. Step 3 -> Enter in the Alias Name. Step 4 -> Enter the external email address as provided by your ISP. Optionally you can add this to an organizational unit. Do so by click the Browse button and then making a selection. Step 5 -> Click the Save button. Once saved the new contact will show. Step 1 -> Click on mail flow. 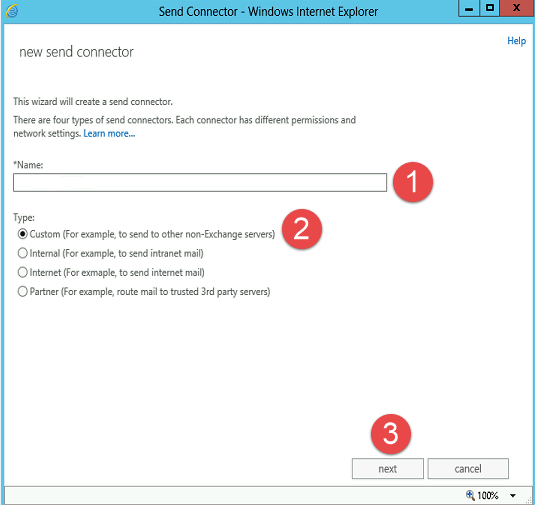 Step 2 -> Click Send Connectors. Step 3 -> Click the + button. Step 1 -> Type in the connector name. E.G. Journal Connector. Step 2 -> Click on Custom. On the next page add in a smart host. Make sure your authentication is set to none. Once the next window comes up select the server. Once completed the server will show. By default, the maximum send message size is set to 10 MB. 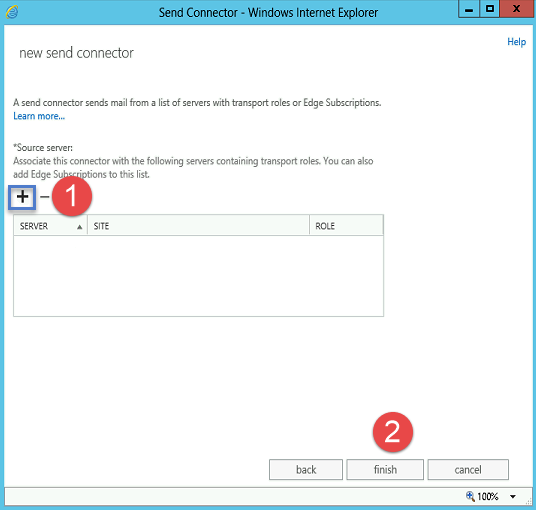 You can change the maximum send message size to 100 MB as an example. 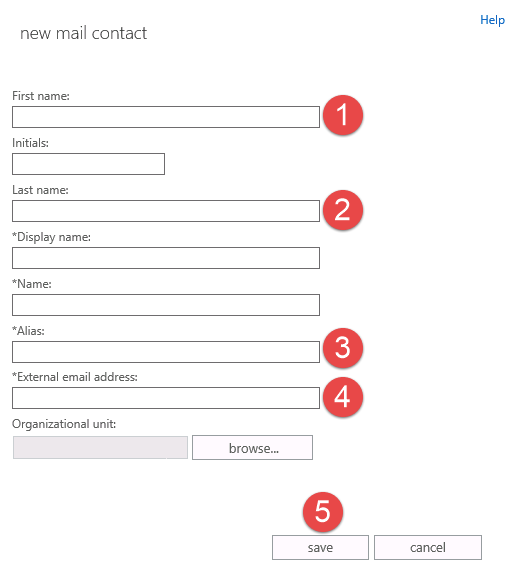 Step 3 -> Double Click on the mailbox database that requires journaling activation. Click Browse next to the journal recipient field. Select the Journaling Contact you created earlier. 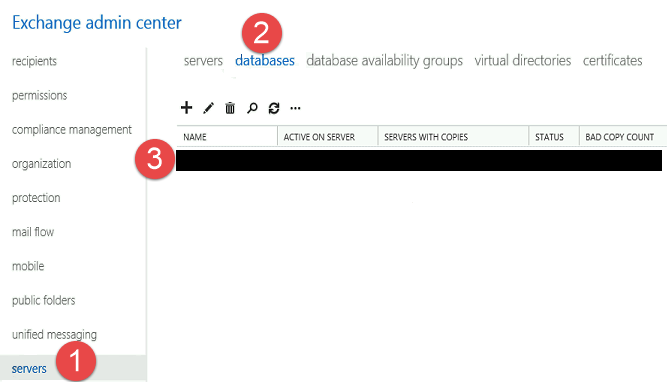 Perform the above steps if you have additional mailbox databases you need to activate this on. Step 1 -> Click on Compliance Management. Step 2 -> Click Journal Rules. Step 1 -> Enter a name for the journal rule. Step 3 -> Here you have 3 options, All Messages, Internal Messages Only, External Messages Only. Select one of them. Step 4 -> Enter in the email address that will receive the journal reports. Step 5 -> Click Save. As shown above the journal rule is enabled.